These economic and environmental impacts are of no small measure. Nearly half the world’s population relies on rice as its dietary staple and about 75% of that supply is generated by small-scale, irrigated production—simply put, small farmers. This type of production consumes up to one-third of the Earth’s annual freshwater supply, depletes soils, and after cattle, is the second leading cause of man-made methane production (a major contributor to climate change). 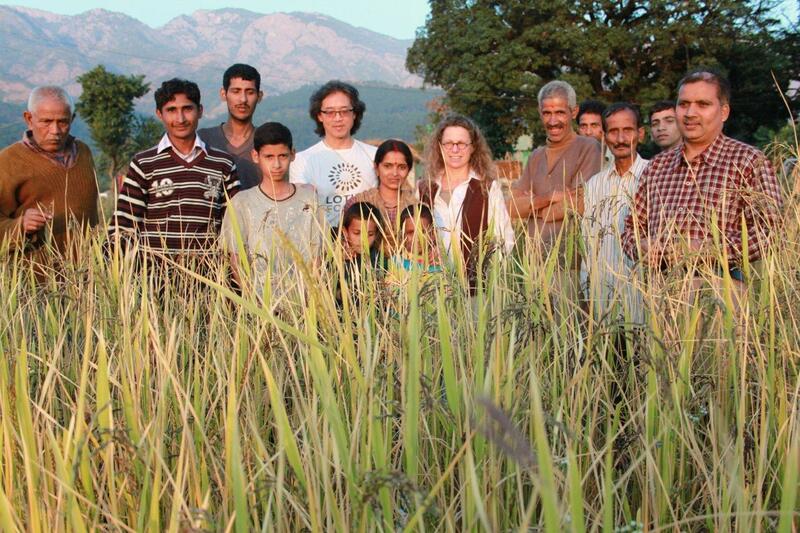 Two years after that trip, Levine and Lee co-founded Lotus Foods, Inc. with a mission to support sustainable global agriculture by promoting production of traditional heirloom rice varieties, some of which may otherwise have become extinct, while enabling small family rice farmers to earn an honorable living. Lotus Foods works with in-country partners to source rice from Bhutan, Cambodia, China, India, Indonesia, Thailand, Italy, and Madagascar, and distributes it in natural food and specialty grocery stores in the US and Canada. In addition, Levine and Lee faced a challenging supply chain. On one side, they were working with farmers to improve quality assurance (for US markets), and helping to educate them on the long-term impacts of sustainable practices versus the short-term economic rewards touted by conventional distributors. On the other side—distributors, retailers, and consumers—needed education on the value of diverse rice varieties and fair-trade pricing. But their passion for their mission was always there, and, slowly but surely, the company gained traction. In 2005, Lotus Foods developed a game-changing partnership. They were contacted by staff at Cornell University who were involved in promoting research and awareness about a sustainable rice-growing methodology called System of Rice Intensification (SRI). The SRI methodology uses significantly less water than the conventional flooding methods used to grow rice, and results in higher yields and the need for fewer inputs (seed, synthetic fertilizer and pesticide, and often labor). Furthermore, whereas the water-logged soil of conventional rice paddies is ideal for methane production, SRI fields with drier soils and healthier plants are not. SRI improves global food security, empowers poor households, conserves water resources, and promotes human and environmental health. Today, SRI is enabling some of the world’s most marginalized farmers to double their yields (or more) using 50% less water, 80-90% less seed, and no agrochemicals. Over 2.5 million farmers in 50 countries have recorded successful adoption. Lotus Foods now helps their current farmers transition to SRI growing methods, and partners with existing communities of SRI farmers to bring their rice to market. Sustainability and economic empowerment remain at the heart of their efforts. “New farmers must produce enough for themselves and their community before exporting even becomes a possibility,” says Lee. As farmers flourish, so does Lotus Foods. In recent years, the company made significant investment in rebranding their line, building their management team, and solidifying their commitment to SRI. Despite some losses during the recession, the company is now poised for growth and has been profitable for the past two quarters. Lotus Foods recently developed a new partnership with Whole Foods which is now distributing a new value-added product line. The company is continuing to develop new products and distributes via other major retailers like Safeway and Costco. In January 2013, RSF financed a line of credit to support this growth.